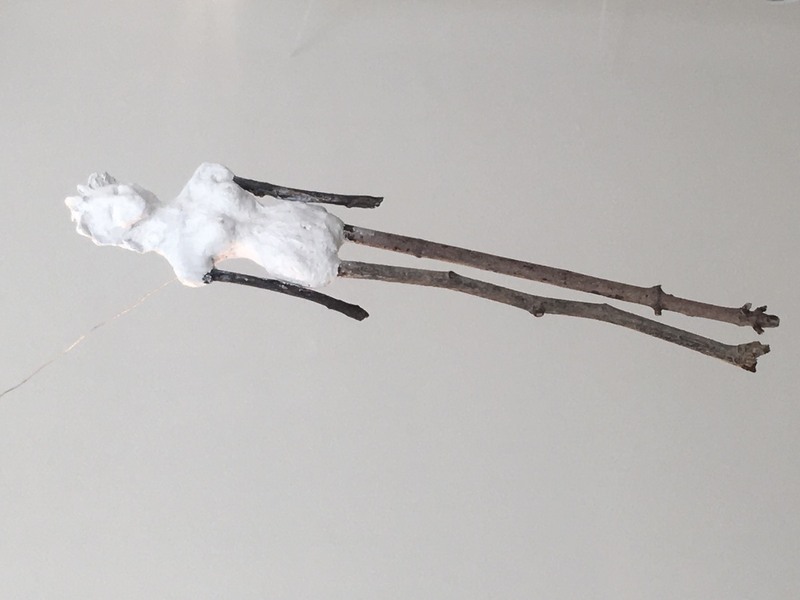 Perhaps only a few visitors will notice the ceramic white witch hanging from the rafters of the Lucas Lucas Gallery for Dalila Pasotti’s ethereal sculpture show INFINITAS X INCOGNITA. She’s not for sale, but she’s blessing the works on view. If your eye draws you to her, you’ve already received the insider’s wink to the energy — beliefs in other realms; dream states; and visions — that drove Pasotti to create delicately detailed sculptures. INFINITAS X INCOGNITA: DALILA PASOTTI. Pictures by Susan Kirschbaum for The Untitled Magazine. In ceramic, brass, and alabaster, they seem to traverse everything from mythology to science fiction. Even if you didn’t know the back stories, you’ll walk away with the faces and abstract shapes she has hand chiseled etched into your brain long after leaving the space, like some wonderful journey backward and forward in time. 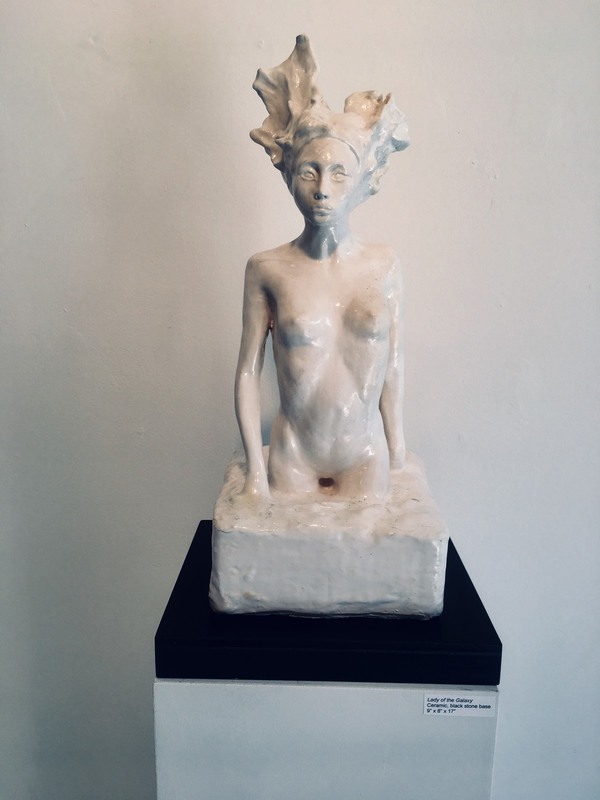 Pasotti’s “Lady of the Galaxy” a beautiful white ceramic visage and torso of a woman who seems to have emerged from rock, feels like the nymph daughter of ‘Mother Earth’ herself. Another piece called “The Dreamer” is the face of women with closed eyelids with thin metal rods jutting out of her head. A pedestrian may equate this with acupuncture. 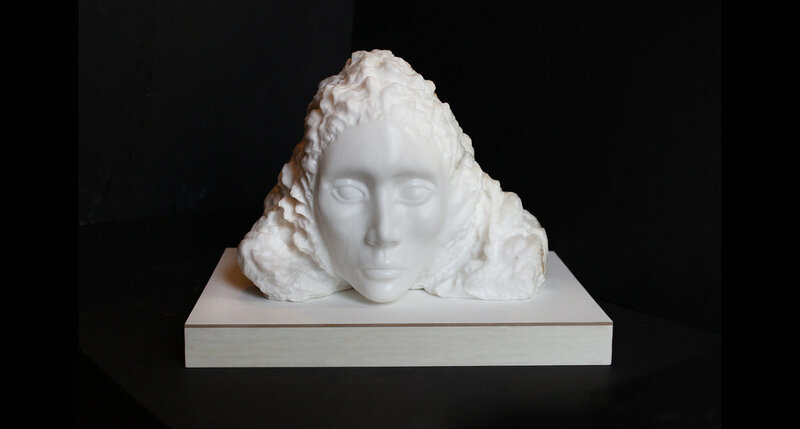 Pasotti says it represents “the connection with the above.” The head of a male with gaps in his skull — entitled “Stoicism” — the artist created when she split from her husband. The scars on the piece indicate the existence of what she calls “a black hole:” that there are deeper meanings to why things happen. 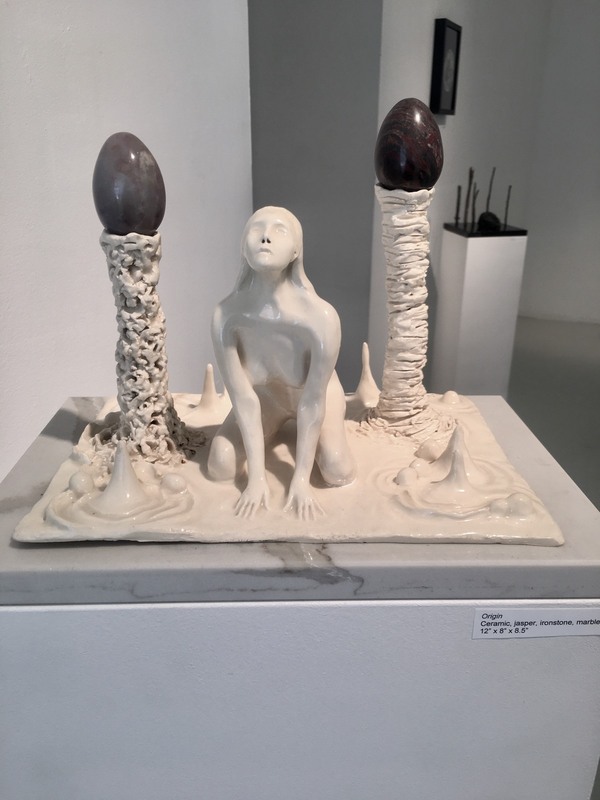 Other thematic creatures in this show include narwhals, called `the unicorns of the sea’ because they had tusks and are now almost extinct; and a sphinx (ceramic black stone and bronze) that Pasotti has dubbed “her spirit animal” since she started seeing sphinxes everywhere for the past year. Now she’s making her own. Black and white hanging cocoons that I had assumed were chrysalises represent something called ‘the Calabi Yau Manifolds’ eleven dimensions in astrophysics. There’s also a sculpture of a woman between two phallic shapes topped with eggs entitled “Origin.” If this all sounds a bit scientific, that’s no coincidence. Pasotti — a self-taught sculptor — graduated from the University of Turin in Italy with a degree in Natural Sciences. She began first as a jewelry designer — creating shapes from wax — then emerged into art with clay, bronze, and alabaster. A few of her hand made necklaces, now in ceramic and bronze are also for sale in this show. 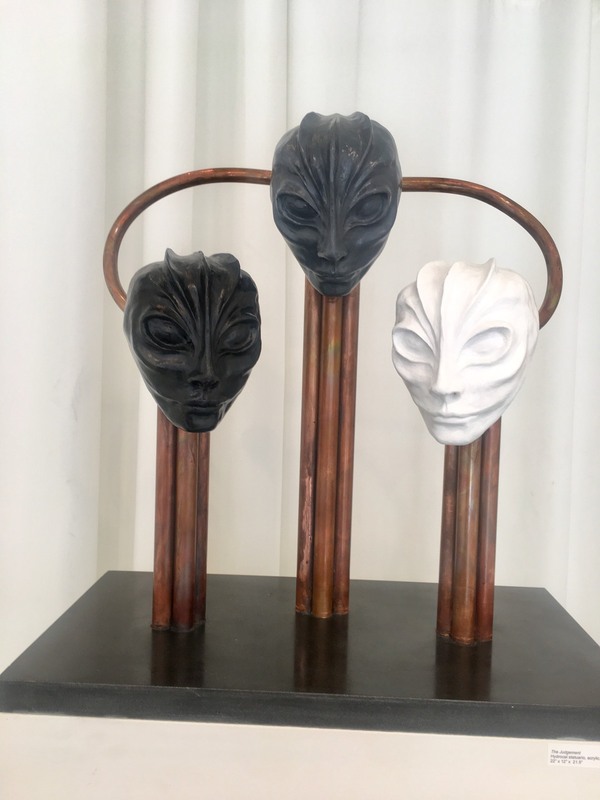 There’s something beautiful about these works, even the ones that feel a bit eerie like “Judgement”: three heads in black and white that hint at aliens watching us, although that was not the artist’s intent, more that we are all accountable for our actions by some force of the universe. The fact that Pasotti could create such an incredible collection from an innate gift of chisel and vision certainly speaks to some force behind talent that neither science nor the ordinary 3D mind can grasp. INFINITAS X INCOGNITA, the work of Dalila Pasotti, now through April 19th at Lucas Lucas Gallery, 57 Conselyea Street, Brooklyn. Weds – Saturday 12 to 7 pm and by appointment.